This weekend (Feb. 6-10, 2019), everyone’s flocking to the Cincinnati Auto Expo at Duke Energy Center, where they’ll see the latest and greatest from the automotive world. Not only are there exciting and exotic new vehicles, there also a few antique models. This event is billed at the 31st Expo, but car shows in Cincinnati first appeared in the 1900s – well over 100 years ago. They sometimes were part of a festival and in a few years they were held as an independent event. Starting in 1910, these annual shows were held in Cincinnati Music Hall. These events were popular from the start – both with auto dealers and the public. At the first Music Hall car show, held in Horticultural or South Hall, both floors were jam-packed and show managers had to turn away some eager dealers who missed the application deadline. (A few of these dealers then staged their own exhibits in local hotels.) 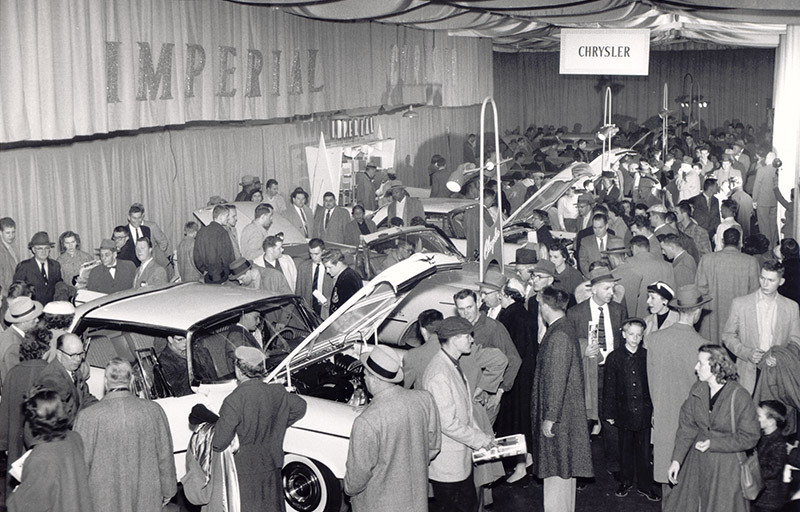 Still, the show – held February 21 to 26 – featured more exhibitors than that year’s popular New York City auto show. For the first expo in 1910, vehicles were displayed in the setting of a tropical garden: a “carpet” of heavy green burlap covered the floor, low boxwood hedges separated dealers and the walls were covered with Southern smilax and red poinsettias. Nearly two hundred machines were on display, at prices that ranged from $500 to $6,000. • 15 of the machines were made in Cincinnati! From the very beginning, gasoline and oil were strictly forbidden in Music Hall. Vehicles tanks were to be emptied before they arrived – specifically no closer than a block away from the structure. To comply, nearby dealers would often just tow a car the entire way. During the show, when manufacturers and exhibitors wanted to demonstrate the product, small electric motors powered those operations. Even though that ban on combustible liquids was strictly enforced, the promoters took no chances. They purchased a large insurance policy, and stationed firemen in all parts of the building. The first auto expo in Music Hall was quite a success! It was presented by the Automobile Club of Cincinnati, which was formed in 1901. 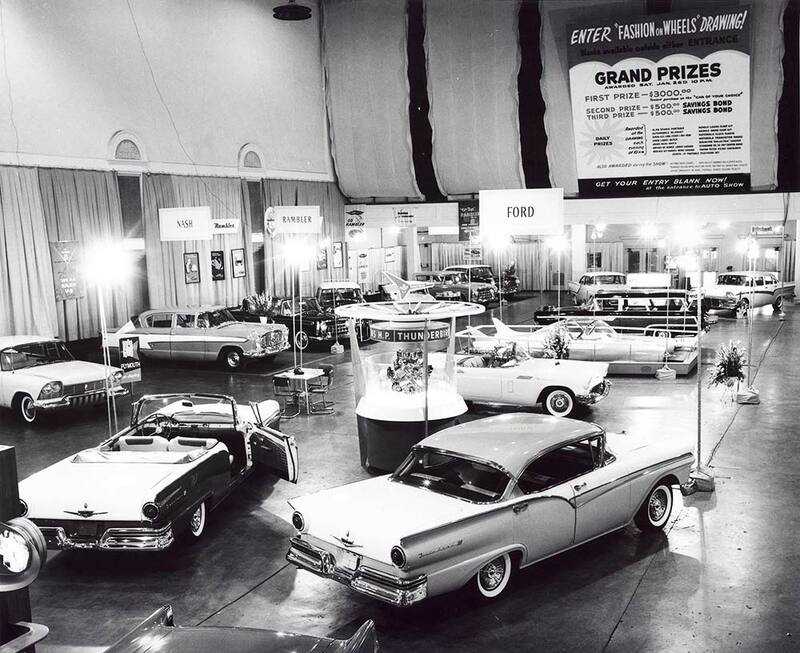 Following this first motor exhibit, a rift of sorts developed between the Auto Club and the Auto Dealers, each of whom wanted to sponsor future Auto Shows. However, they also feared that the city could not support more than one annual auto exposition. To gain the advantage, the dealers formed their own group. 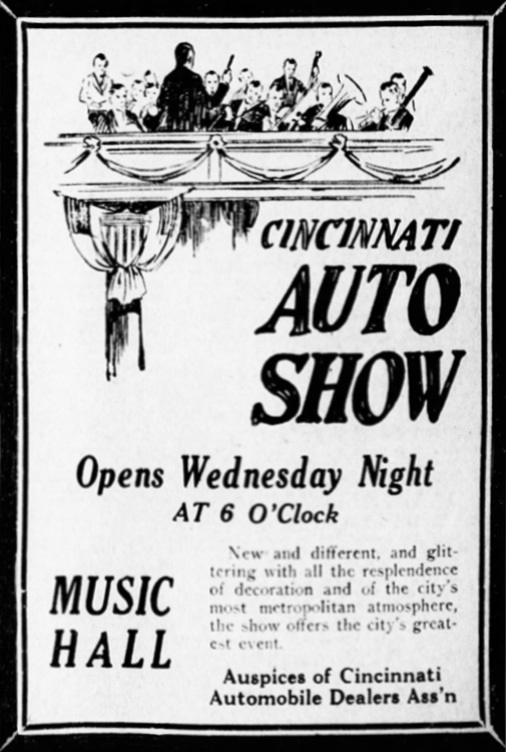 Starting in 1911, the Cincinnati Automobile Dealers Association sponsored the Auto Shows in Music Hall for several decades. 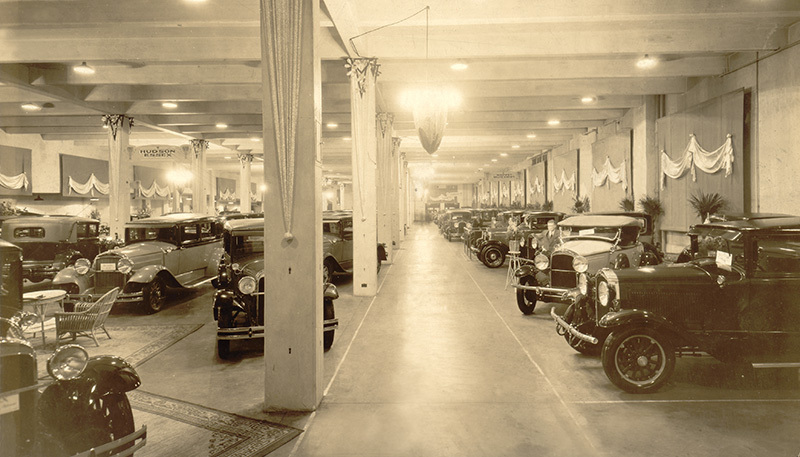 In 1911, the auto show ran six days but expanded in size to include both floors in the north and south halls. Despite the additional space, dealers complained about lack of space. Worse, some who wanted to take part needed to be turned away. The décor changed each year, with promoters keen on outdoing previous displays of styles and colors. In 1911, the George Fern Decorating Company prepared both halls for exhibitors. The show was considered so important that one dealer who missed the application deadline proposed placing his vehicles in a freight elevator – even if it was going to travel between floors! 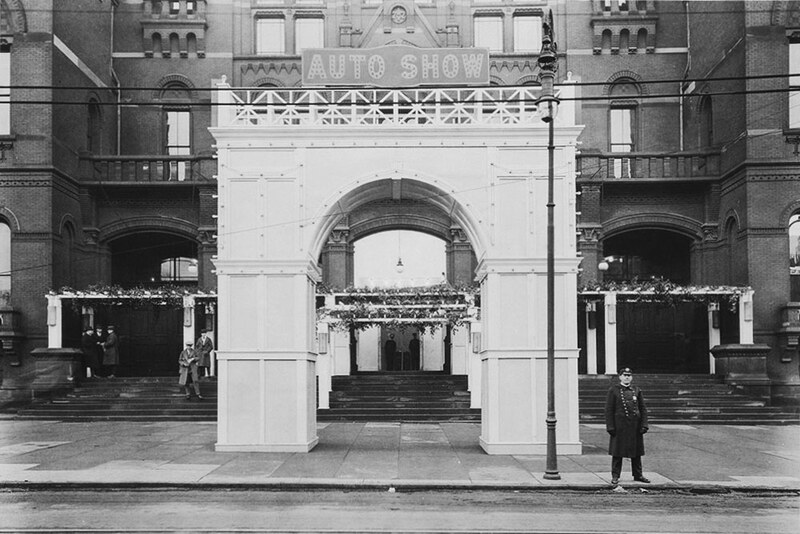 In 1916, military orchestras gave concerts during the Auto Show. And a series of films shown in the main auditorium of Music Hall gave visitors a “behind the scenes” look at car manufacturing plants. 1917 brought farmers to Music Hall, to view exhibits of trailers that could be attached to cars. Using a trailer meant the farmer need own only one vehicle and could still have the capabilities of a small truck. In 1918, after the U.S. entered WW1, the car show was held in October and had a bit of a “military air.” Influenced by the war, car models showed designs reminiscent of armored cars. There were designs pointed like a torpedo, and a “conning-tower” windshield – a windshield with two sides separated by a pointed frame, which resembled the prow of a vessel. Colors included submarine green, camouflage brown and battleship grey. Further, the U.S. Navy had an exhibit at the Auto Show, which included shells, torpedoes, mines and other equipment. Films featuring army and navy life were shown daily in the auditorium. In 1920 and ’21, the annual Auto Show, again held in the fall, was downscaled to exclusively display passenger cars. 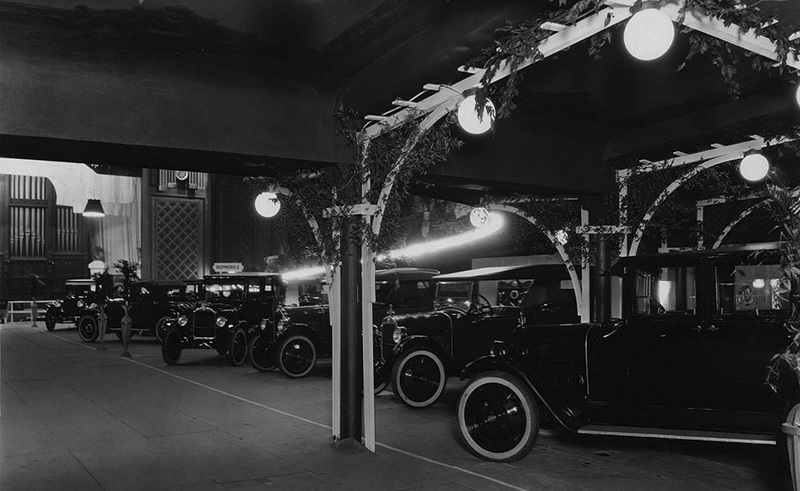 The Auto Show returned to a late-winter date in 1922. 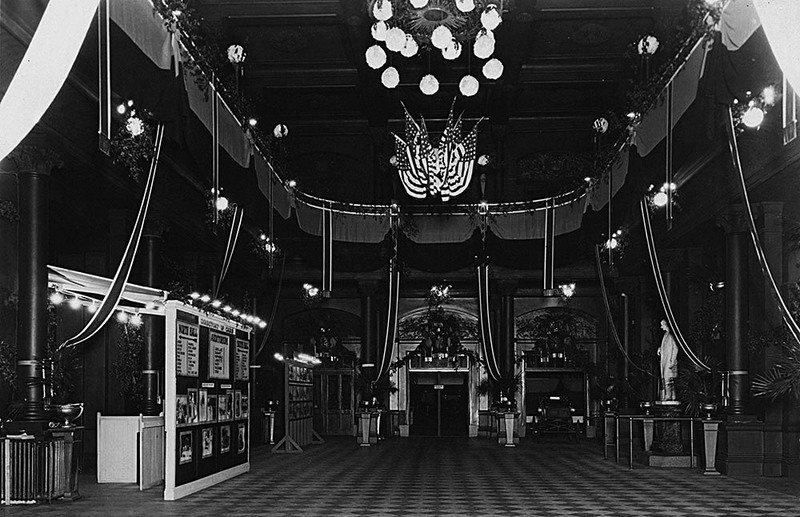 For the 1921 show, a temporary floor was installed in Music Hall Auditorium. The floor extended over the seats, running from the stage nearly to the rear of the room. This nearly doubled the capacity of the facility for the Auto Show. And, the temporary flooring was made available for future expositions. 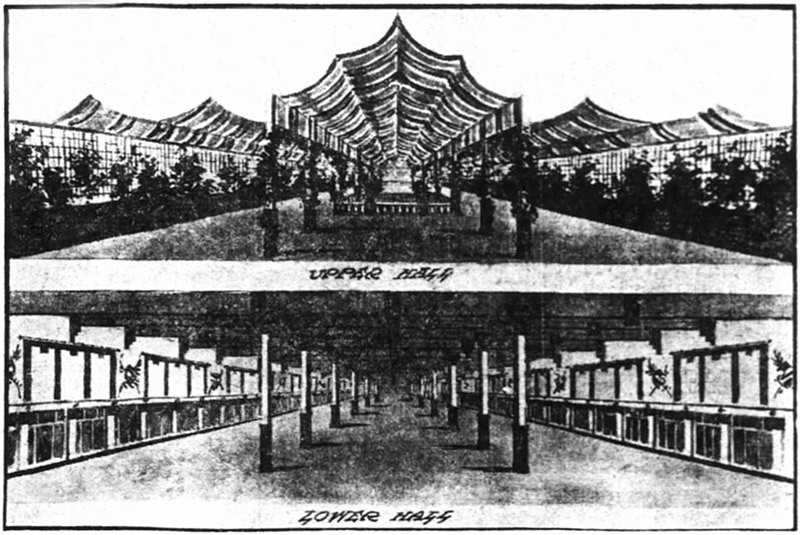 For the 1921 show, dealers and distributors were asked to ensure that their displays align with the general decorations for their area. The south hall had a Chinese theme, while the decoration for the north hall and auditorium was along the lines of the Garden of Versailles, where the world peace pact was signed. Also this year: three orchestras were on hand to entertain attendees, one in each of the main halls. Musicians also entertained guests in the café, which was on the mezzanine floor of South Hall. Stoves and heaters were installed in the wings to keep people comfortable while they visited the show. And, during colder than normal temperatures, a special “overnight” team was employed to keep the fires burning and the buildings warm. By 1922, the Auto show returned to its original late-winter schedule. Car prices had fallen and become stable, and the quality of automobiles had increased. Used cars have become a problem. 95% of car sales involved a trade-in, and there was an abundance of them at low prices. One notable fact this year: the increase in the number of women attending the auto show and how interested they are in the mechanics of a car. Both reflected the increasing number of women who drive cars. When people can see new models in local showrooms, how can you keep the crowds coming to the auto show each year? As the song goes, you gotta have a gimmick. On this note, the 1925 Auto Show did not disappoint. The decor was described as lavish and gorgeous. To bring a touch of spring to people slogging through snow and ice enroute to Music Hall, show managers installed apple and orange groves in full blossom in all three Music Hall buildings – blossoms which brought with them their sublime fragrance! A wicker cage holding a canary was hung in each tree – 400 total. Music Hall was filled with the music of their songs! Arrangements were made for the first Auto Show Radio Wedding. Yes, a young couple agreed to be married in a very public ceremony. The Great Organ played the Wedding March and listeners across the nation “attended” by means of the radio frequency. The ceremony was conducted on the Music Hall stage by the pastor of the First Presbyterian Church and the newlyweds received a 1925 sedan as a gift from a local car company. The 1929 Auto Show ratcheted up the “class” factor by featuring a Grand Salon in which each exhibitor’s “finest and most distinctive” model was shown by sales reps in formal evening dress. Another unique draw: In 1931, during the Annual Auto Show, there was a demonstration of “television” – the first public showing outside of New York and Chicago. In September 1938, the Cincinnati Automobile Dealers’ Association decided that, after 28 years, they would not hold an auto show in November, as scheduled. They cited the high cost of the show as the key factor in their decision. The Annual Cincinnati Auto Show ended up being on hiatus for nearly two decades. It was revived in January 1957 and again held in Music Hall. Sixty thousand people checked out over 100 models during the 6-day event, compared prices, dreamed about ownership, and, occasionally, made a purchase. The same show was held in the north and south wings in January 1958, and featured both domestic and foreign cars. 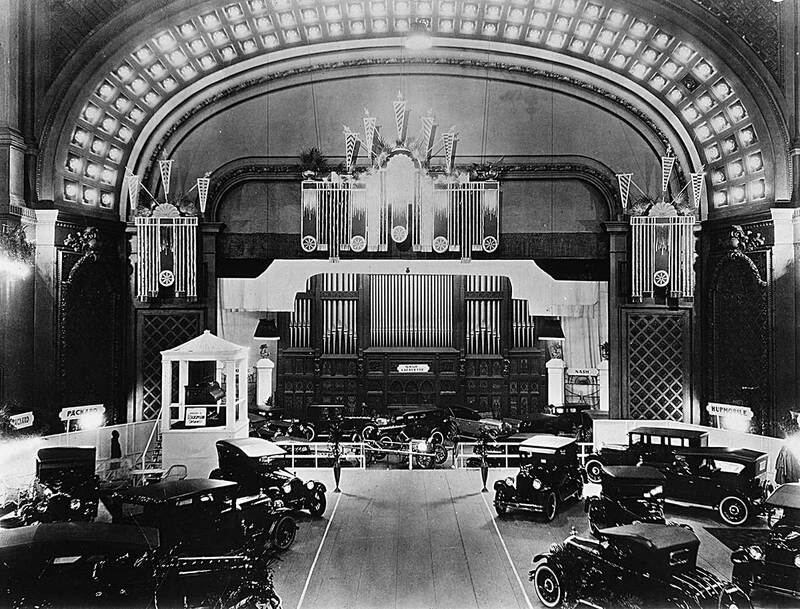 It was to be the last time the Auto show was held Music Hall. In following years, a few new car displays were held in Tri-County Mall. 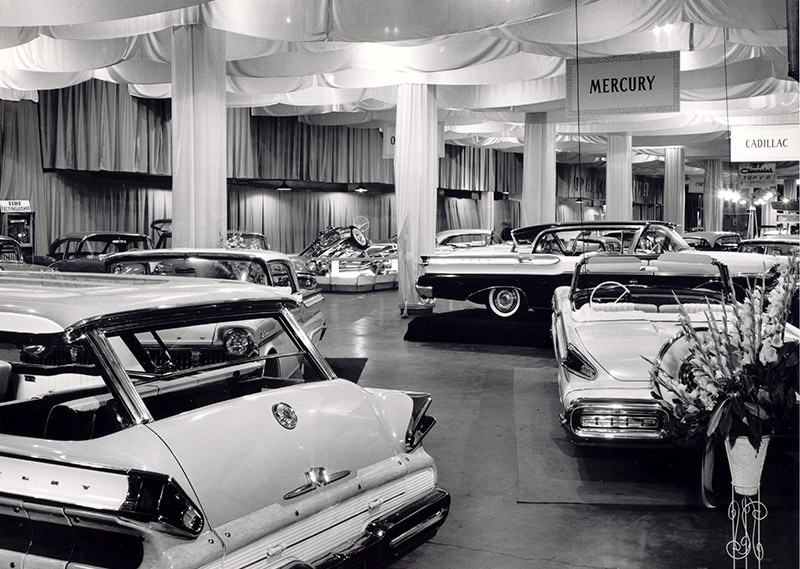 In 1968, the Auto Show opened at the newly-constructed Convention Center downtown. A very interesting and informative write up. Great photos I have never seen before. Person who put this all together should get credit, and standing ovation!! Thanks, Ron! The post has just been updated to include three new photos. Assume article Joanne! I had seen some photos of car shows and heard stories about a ramp in the South hall to bring cars up to the ballroom. This was a great informative read for me. I know I attended some Custom Cavalcade shows in the North Hall in late 50s or 60s but nothing earlier. Wow!! 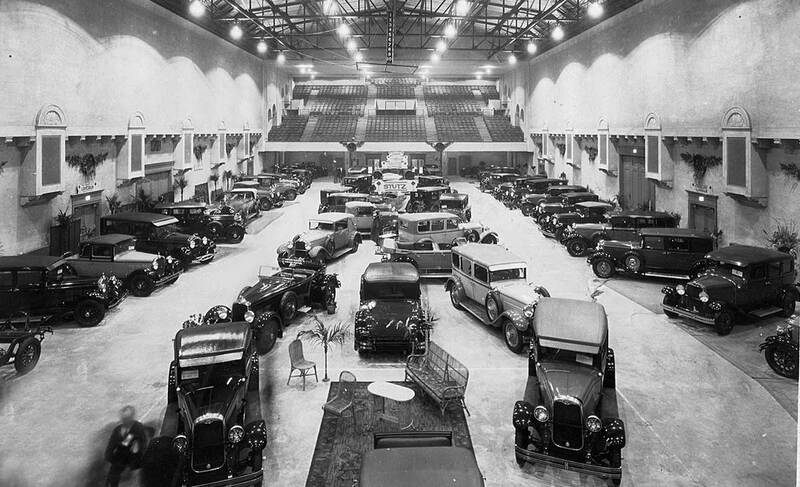 This is an extraordinary article on the history of the auto shows. Now I have the content to put the pictures. Barbara, thank you! You and all the SPMH Program Guides are incredibly knowledgeable, give awesome, entertaining tours of Music Hall – and are an inspiration for all the work on SPMHcincinnati.org. Steve, how exciting and what great memories! I’d love to hear your stories. Thank you! Would love to heard the birds! Snazzy cars.